BR, Collett 57' Bow Ended D98 Six Compartment Brake Third (Right Hand), W5508W. BR, Collett 57' Bow Ended D98 Six Compartment Brake Third (Left Hand), W5507W. 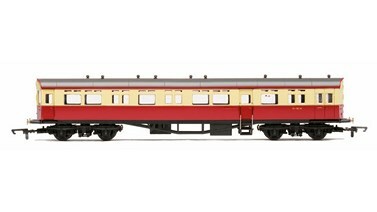 BR, Collett 57' Bow Ended E131 Nine Compartment Composite (Right Hand), W6242W. BR, Collett 57' Bow Ended E131 Nine Compartment Composite (Right Hand), W6631W. 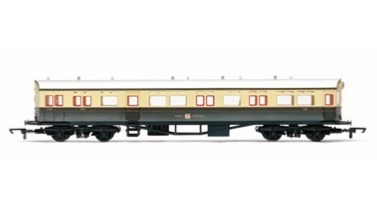 BR, Collett 57' Bow Ended E131 Nine Compartment Composite (Left Hand), W6237W. BR, Collett 57' Bow Ended E131 Nine Compartment Composite (Left Hand), W6630W. GWR, Collett 57' Bow Ended D98 Six Compartment Brake Third (Right Hand), 5504. GWR, Collett 57' Bow Ended D98 Six Compartment Brake Third (Right Hand), 4972. GWR, Collett 57' Bow Ended D98 Six Compartment Brake Third (Left Hand), 5503. GWR, Collett 57' Bow Ended D98 Six Compartment Brake Third (Left Hand), 4971. GWR, Collett 57' Bow Ended E131 Nine Compartment Composite (Right Hand), 6627. GWR, Collett 57' Bow Ended E131 Nine Compartment Composite (Right Hand), 6362. 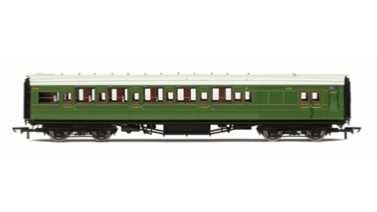 GWR, Collett 57' Bow Ended E131 Nine Compartment Composite (Left Hand), 6626. 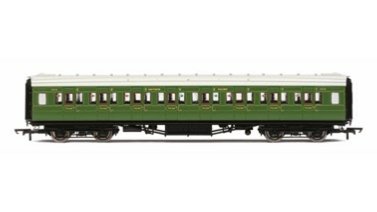 GWR, Collett 57' Bow Ended E131 Nine Compartment Composite (Left Hand), 6360. Pullman, 5-BEL 'Brighton Belle' Coach Pack with lights. Unit No. 3053, Trailer Parlour First Kitchen, 'Gwen', 'Mona' and Trailer Parlour Third, Car No. 85. Pullman ‘J’ Type ‘Devon Belle’ Observation Car No. 13. Virgin, Mk3 Trailer Standard Open (TSO), 12087. Virgin Trains, Mk3 Trailer Standard Open (TSO), 12045. Virgin Trains, Mk3 Trailer Standard Open (TSO), 12132. Virgin, Mk3 First Open (FO), 11074. Virgin Trains, Mk3 First Open (FO), 11097. Virgin Trains, Mk3 Buffet (TRFB), 10235. BR, Mk3 First Open (FO), 41099. BR, Mk3 Buffet (TRFB), 40711. BR, Mk1 Tourist Second Open, M4428. BR, Mk1 Second Open, M4365. BR, Mk1 Corridor Brake Second, M34466. BR, Mk1 Corridor Composite, M15185. BR, Mk1 Corridor Second, M25633. BR, Maunsell Corridor Composite, S5145S 'Set 399'. BR, Maunsell Corridor Four Compartment Brake Second, S3233S 'Set 399'. BR, Maunsell Corridor Four Compartment Brake Second, S3232S 'Set 399'. BR, Maunsell Corridor Composite, S5673S 'Set 230'. BR, Maunsell Corridor Six Compartment Brake Second, S2764S 'Set 230'. BR, Maunsell Corridor Six Compartment Brake Second, S2763S 'Set 230'. BR, Maunsell Open Second, S1346S. BR, Maunsell Corridor Second, S1113S. SR, Maunsell Open Third, 1375. BR, 63' Collett A30 Autocoach, W193W. GWR, 63' Collett A30 Autocoach, 190. BR, Mk1 First Open, W3090. BR, Mk1 Brake Second Open, E9248. BR, Mk1 Brake Second Open, W9264. BR, Maunsell Kitchen/Dining First, S7861S. SR, Maunsell Kitchen/Dining First, 7865. SR, Maunsell Kitchen/Dining First, 7869. BR Mk2E Coach Open Brake Second (BSO) '9502', Executive Livery. BR Mk2E Coach Open First (FO) '3237', Executive Livery. BR Mk2E Coach Tourist Open Second (TSO) '5889', Executive Livery. BR Mk2D Coach Open Brake Second (BSO) 'E9481', Inter-City Livery. BR Mk2D Coach Open First (FO) 'E3180', Inter-City Livery. LMS Corridor 1st Class '1041', Crimson Lake - Era 3. LMS 68' Dining/Restaurant Car '238', Crimson Lake - Era 3. SR 58' Maunsell Rebuilt (Ex-LSWR 48') Nine Compartment Third Class Coach '320'. SR Green. SR 58' Maunsell Rebuilt (Ex-LSWR 48') Six Compartment Brake Composite Coach '6403' - Set 44, SR Green. SR 58' Maunsell Rebuilt (Ex-LSWR 48') Six Compartment Brake Third Coach '2628', SR Green. SR 58' Maunsell Rebuilt (Ex-LSWR 48') Eight Compartment Brake Third Class Coach '2638' - Set 44, SR Green. BR, Mk1 Coach First Open, E3050, Maroon. BR Mk1 Coach Brake Second Open 'E9220', Maroon. GWR, Mk3 Trailer Standard (TS), 42581. GWR, Mk3 Trailer Standard (TS), 42129. GWR, Mk3 Trailer Standard (TS), 42250. GWR, Mk3 Trailer Guard Standard (TGS), 44086. GWR, Mk3 Buffet (TRFB), 40743. BR Mk1 Coach First Open 'W3123', Blue & Grey Livery. BR Mk1 Coach Tourist Second Open 'W5025', Blue & Grey Livery. BR 58' Maunsell Rebuilt (Ex-LSWR 48') Nine Compartment Third Class Coach 'S280S', Maroon. BR 58' Maunsell Rebuilt (Ex-LSWR 48') Six Compartment Brake Composite Coach 'S6405S' - Set 46, Maroon. BR 58' Maunsell Rebuilt (Ex-LSWR 48') Six Compartment Brake Third Coach 'S2627S', Maroon. BR 58' Maunsell Rebuilt (Ex-LSWR 48') Eight Compartment Brake Third Class Coach 'S 2640 S' - Set 46, Maroon. Brake Corridor 3rd. Southern Green. Pullman, Standard 'K' Type Second Class Kitchen, Car No. 58. Pullman, Standard 'K' Type First Class Kitchen, 'Argus'. Pullman, Standard 'K' Type Second Class Parlour, Car No. 34. Pullman First Class Kitchen Car 'Minerva'. SR, 58' Maunsell Rebuilt (Ex-LSWR 48'), Nine Compartment Third, 364. SR, 58' Maunsell Rebuilt (Ex-LSWR 48'), Six Compartment Brake Composite, 6401 'Set 42'. SR, 58' Maunsell Rebuilt (Ex-LSWR 48'), Six Compartment Brake Third, 2625. Virgin Mk2E Standard Open Brake. Extensive interior detail & with working table lights. Pullman, All-steel 'K' Type Third Brake Parlour, Car No. 78. BR, Collett 'Bow-Ended' Corridor Composite (Right Hand), W6145W. BR, Collett 'Bow-Ended' Corridor Composite (Left Hand), W6146W. BR, Collett 'Bow-Ended' Corridor Brake Third (Left Hand), W4926W. BR, Collett 'Bow-Ended' Corridor Brake Third (Right Hand), W4925W. BR, Collett 'Bow-Ended' Corridor Third, W4910W. LMS Non-Corridor 57ft Third Class Brake. 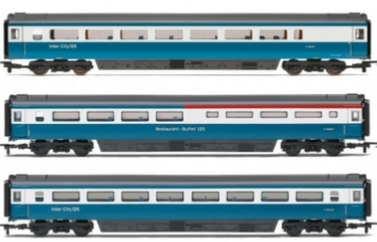 BR Intercity Blue & Grey. LMS Non-Corridor 57ft Third Class Coach. 1st Class Coach BR Crimson No.E 81035 E.
BR Mk1 Maroon, Heavily weathered with Graffiti. BR(e) Maroon. No. E 4473. BR(e) Maroon. No. E 4481.
in BR Blue/Grey with tinted windows. No.E42126. in BR Blue/Grey with tinted windows. No.E42125. in BR Blue/Grey with tinted windows. No.E41064. InterCity Executive Livery with tinted windows. Parcels Coach BR Lined Maroon. BR(e) Maroon. No. E 4542. Mk1 Parcels Coach in BR Maroon. in BR Blue/Grey with tinted windows. BR (ex SR) Green. No. S 34239. BR (Ex-LMS) 50ft Full Brake - BR Blue. BR Western Region 1st Class Kitchen Buffet Car in Blue & Grey. 61'6" BR Teak Corridor Buffet No E9126. LNER Teak Non-corridor 3rd Class Brake Coach. LNER Teak Thompson Non-corridor 3rd Class Coach. LNER Teak Thompson Non-corridor (Lavatory) Composite Coach. Southern Railways introduced Pull-Push trains fairly early on and British Railways continued the practice using converted Maunsell coaches on the Southern Region. BR, 51' Gresley Non-Vestibuled Suburban Brake Third, E86109E. BR, 51' Gresley Non-Vestibuled Suburban Third, E82190E. BR, 51' Gresley Non-Vestibuled Suburban First, E81032E. BR, 63' Hawksworth Brake Composite, W7858W. BR, 63' Hawksworth Corridor Brake Third, W2251W. BR, 63' Hawksworth Passenger Brake, W829W. 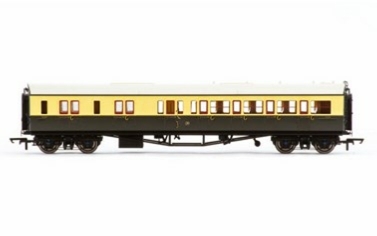 RailRoad Edition LMS Composite Coach. BR Chocolate & Cream. Corridor Second. Railroad Edition. BR Chocolate & Cream. Corridor Composite. Railroad Edition. Railroad LNER Teak Brake Coach. RailRoad LNER Teak Composite Coach. Restaurant Car BR Carmine & Cream.